Early Larkspur was a major lumbering site for railroad ties, telegraph poles and firewood with millions of board feet harvested from the area. With the railroads providing a shipping point, mining was also a large industry with gypsum, red sandstone and potash. With 2 sawmills, a blacksmith shop, hotel, 2 general stores, a post office, school and even a casino, the population soared at the turn of the century. Although ranching was the mainstay of the area, Larkspur and Perry Park were touted as health resorts. People from both Colorado Springs and Denver would come by rail to enjoy the fresh air. A stage line would take people to Perry Park with trumpeters and dancers waiting to greet the coach. 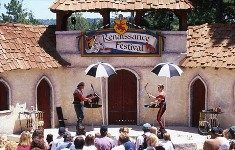 Today Larkspur is more known for it’s annual Renaissance Festival than its place in history. The schools serving Larkspur, and all of the front range communities, are a diverse mix of public systems, charter schools, and private/parochial schools. Charter schools are considered public and will be included in the district listings. Please see the more school connections link for private, charter and home schooling options. Larkspur has a Council/Manager form of government where the City is run by a town manager who implements the councils directives and policies. This system of governing consists of, seven Town Council members who select a Mayor and a town manager. The mayor presides over the council meetings and has one vote. All are elected to a 4 year term. A wiki link to the city’s history and the Larkspur Historical Society. Larkspur began life as a stage stop on the Territorial Road and then became Huntsville in 1862 with a post office! Once the Denver and Rio Grande Railroad reached the town the site had its name changed to Larkspur in December 1871. Folks arrived by both stage and train to be transported to Perry Park for its health and beautiful landscape. Perry Park is now a delightful community nestled in the trees and rock out crops of the front range with an equestrian center for the enthusiast. The Town of Larkspur, due to its size and population, does not have a robust Parks & Recreation Department, so residents utilize the opportunities for recreation throughout the area, a lot of which Colorado is famous for including many horse clubs and hiking trails. The rest may be local golf, flag football or softball teams, walking and jogging path maps, or even recreation centers provided for residents.